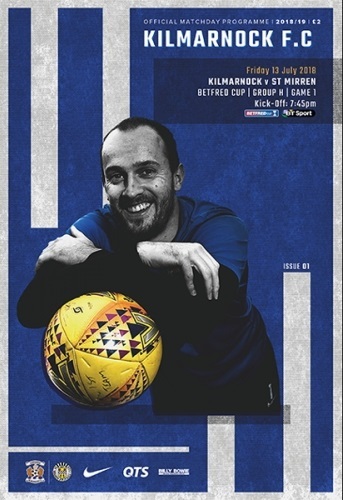 The only thing more common than your match day flutter is the regular occurrence of purchasing your football programme. 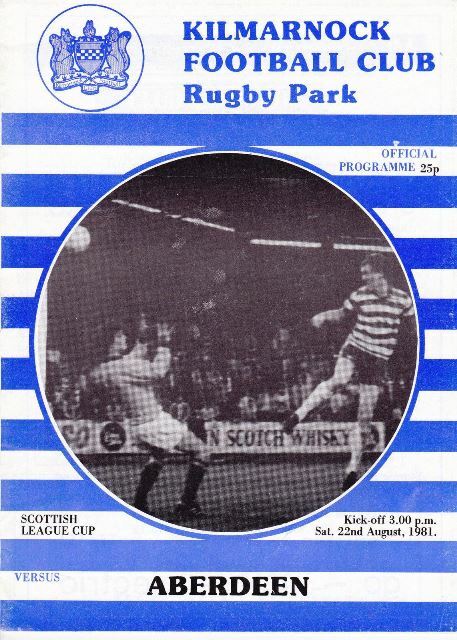 Despite technology making the sports betting side of our football ritual easier, the buying of programmes has survived throughout the ages, with many simply binning the recently bought programme after the game. 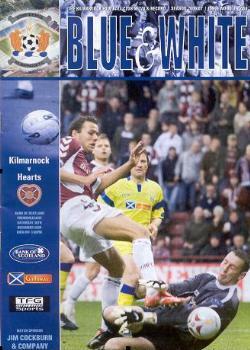 Many programmes for popular fixtures can sell in auction, and can often be an extremely savvy investment. 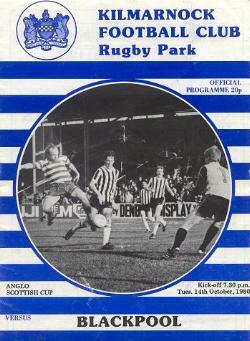 Take for example the 1909 FA Cup Final Programme against Manchester United and Bristol City. 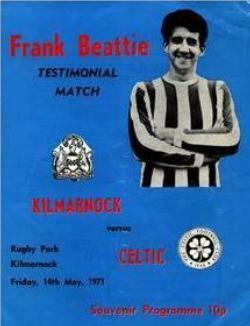 This recently sold at auction for over £23,000, a significant return on investment, so why do people collect football programmes? 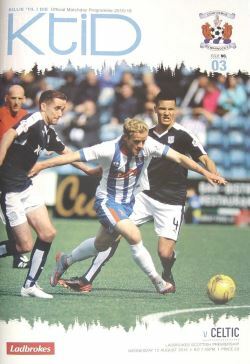 Over the years, those of us who have ever attended a football match have probably have purchased a match day programme. 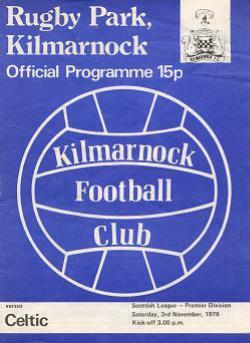 Some of us read them and then simply throw them away. 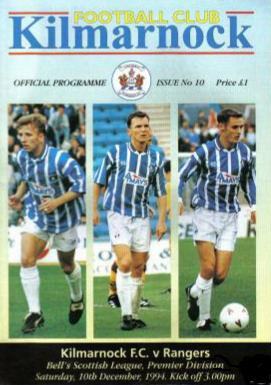 Others start to collect them, methodically and meticulously building up a programme collection over the years. 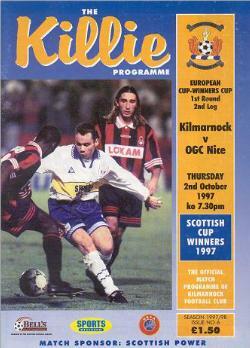 Why collect football programmes? 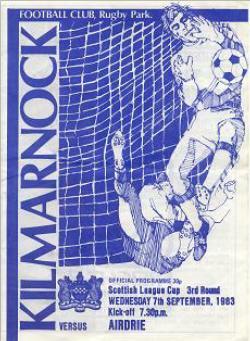 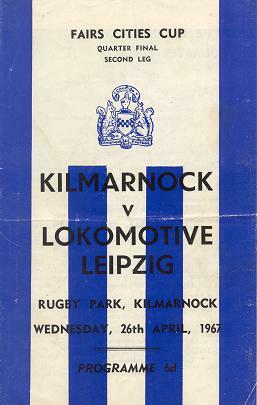 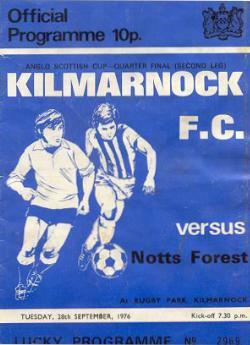 Despite being Scotland's oldest surviving professional football club, there is little evidence of Kilmarnock FC issuing programmes in the early years of its existence. 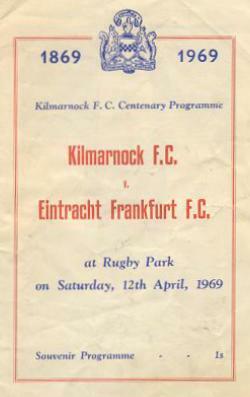 The first evidence of a programme issued by the club was for a match v Rangers in 1899/1900, at the start of the club's first season in Division 1. 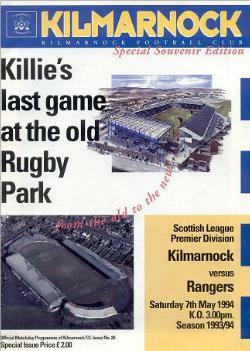 It would appear that those issues did not last long. 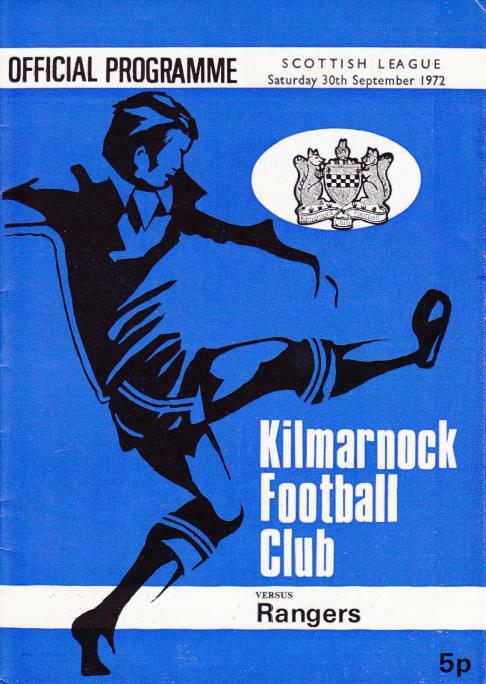 No official programme has ever been seen for the 1920 Scottish Cup Final v Albion Rovers (or for that matter, Killie's other Cup Finals of that era) Surprisingly, programmes from Cup Finals not involving Kilmarnock from that era do exist. 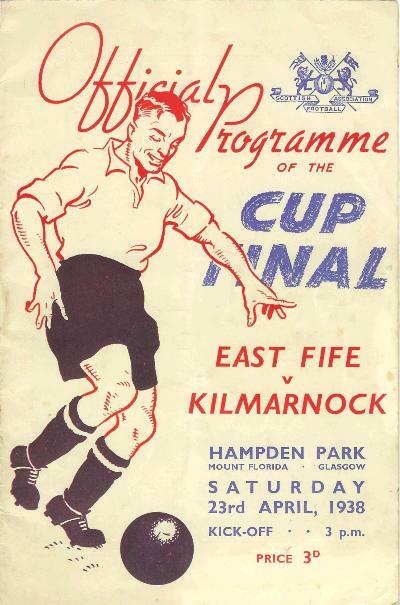 By the time of the 1938 Scottish Cup Final v East Fife, programmes were the norm, and there was even an issue for the 1938 replay (albeit only the original programme with a sticker changing the date). 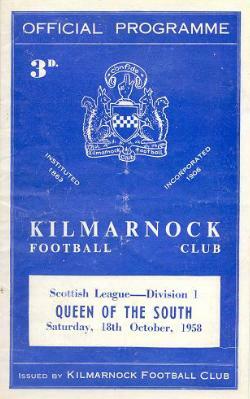 Pre-war programmes do exist for Kilmarnock away matches, principally from prolific issuers such as Celtic, Hearts and Queen of the South. 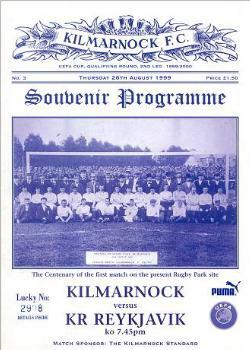 By the start of season 1929/30, Kilmarnock started to issue for most home games starting with the visit of Hamilton Accies on 10th august 1929. 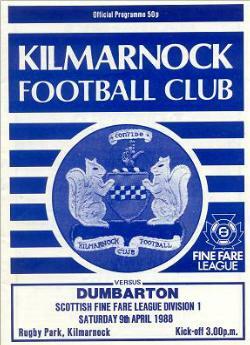 The club also issued for reserve home games in the Alliance League. 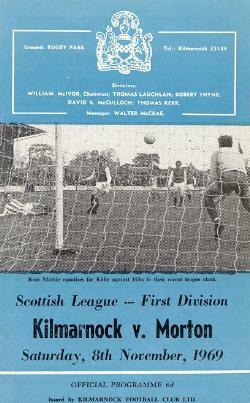 These programmes continued to be issued until season 1939/40, with the last known issue being the Regional League game v St Mirren on 6th April 1940. 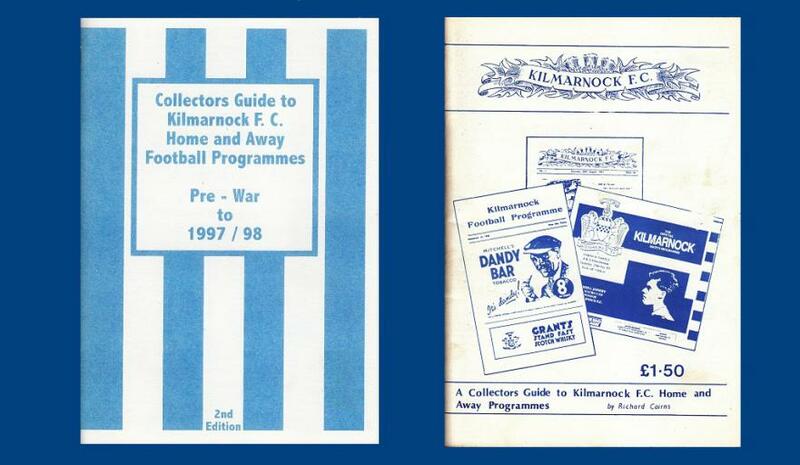 Although League football resumed after World War II in season 1945/46, very few clubs issued programmes. 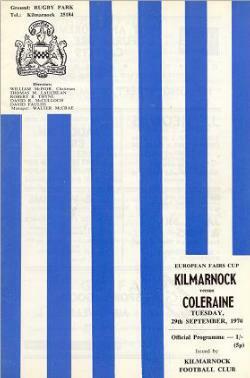 Kilmarnock FC started issuing programmes regularly again in season 1947/48, (example right) with the first being for a league cup tie v Ayr Utd on 30th August 1947. 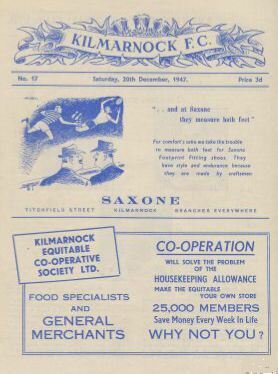 These were produced by Kilmarnock Standard journalist, George Thomson, and for their time, were quite superb issues. 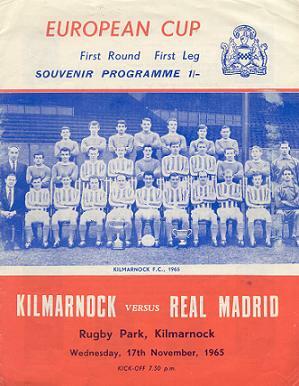 Great value at a price of 3d, (the same price lasted right up until 1969) these issues were detailed to say the least; plenty of club information, history and gossip. 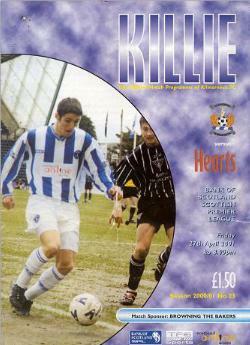 They were produced weekly which meant that most home reserve games were also graced with this super issue. 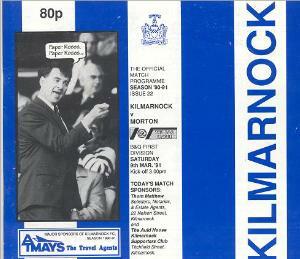 The programmes content showed his obvious knowledge and love of the club, as did his articles in the 'Standard' of the time. 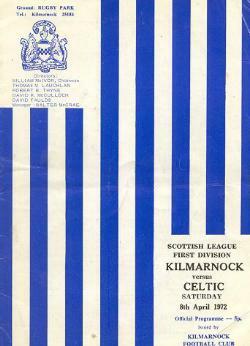 By 1951, the club took over control of the programme and sadly this meant a rapid decline in the issues. 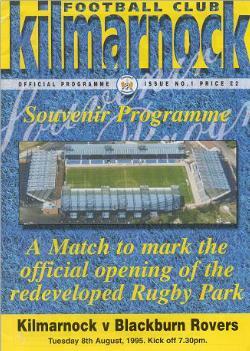 Reserve issues were stopped, and the programme was reduced to only 4 pages. 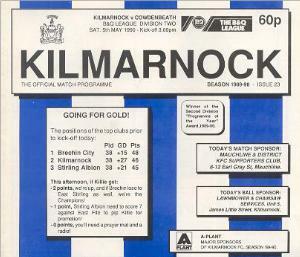 On Killie's promotion back to Division 'A' in 1954, these large, white issues reverted to 8 pages, although content was still very weak. 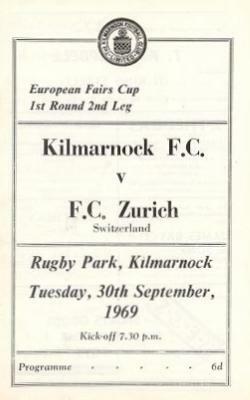 At the start of season 1955/56, the club issued a completely different programme (left). 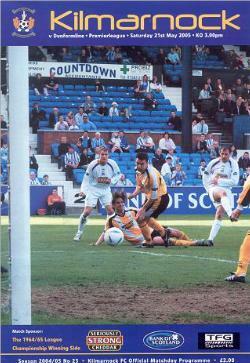 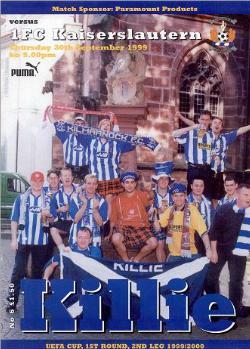 The pictures were usually supplied by the Kilmarnock Standard (just before Sandy Ferguson's time!). 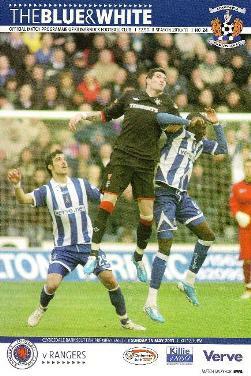 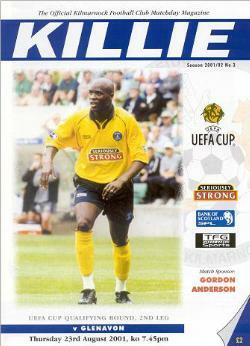 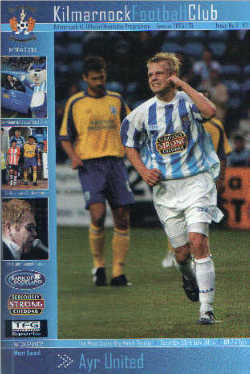 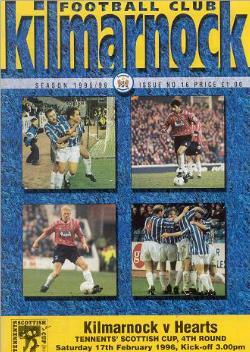 However within a few seasons, a small 'pocket sized' issue was being produced. 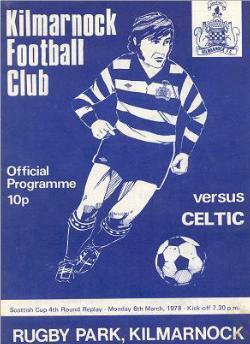 A poor programme with very little content, this was the norm until the start of season 1980/81. 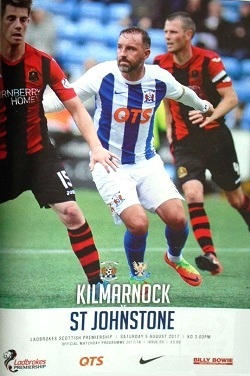 For this season, the programme certainly improved, a much larger sized glossy issue with some super historical articles written once again by George Thomson. 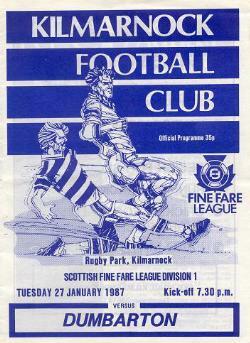 Again, this did not last long, (only 2 seasons) and by the mid 1980s the club's programmes were amongst the worst in the country (right) and pretty well reflected the club's position at the time; in decline, lacking ambition and debt ridden. 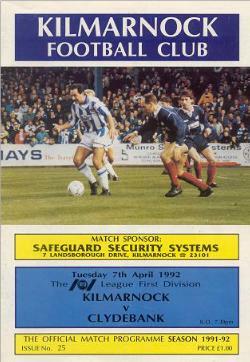 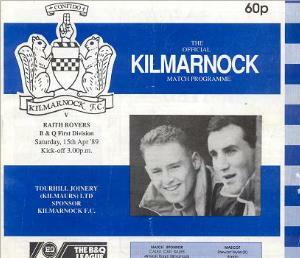 By the start of season 1988/89, (left) the Killie programme was a truly dreadful affair, advert laden and uninspired. 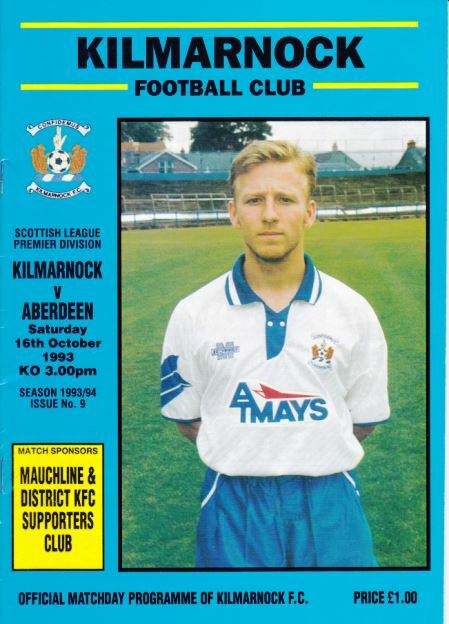 With the arrival of a new management structure in mid season, a local freelance, Frank Tocher was appointed to revamp the programme. 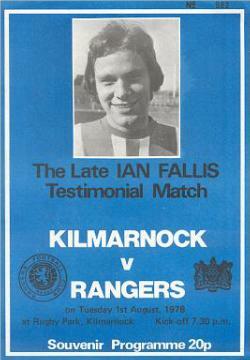 He made an instant difference, with sales improving dramatically and indeed with many 'sell outs.' 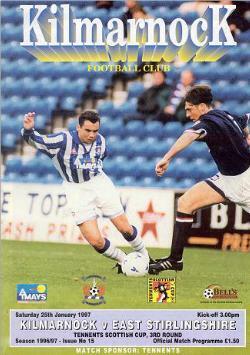 Many of these issues are now proving very hard to obtain. 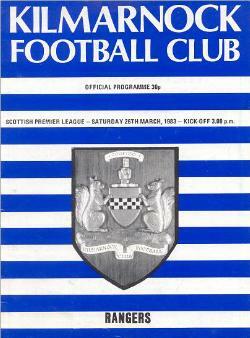 Frank produced the programme until the end of season 1990/91. 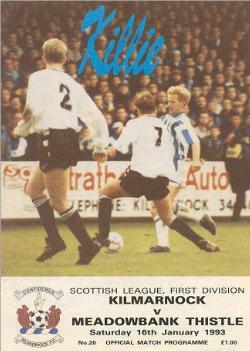 The programme was then taken to an even higher level with Richard Cairns taking over as editor at the start of season 1991/92 (right). 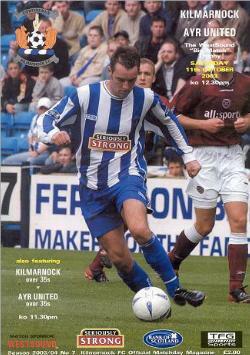 Richard has consistently produced very polished issues over the next decade. 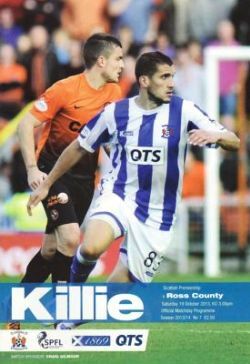 Killie are the only club in Scotland to have won the 'Scottish Programme Of The Year ' award in all 3 divisions of the Scottish league. 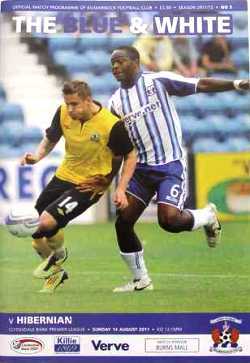 D.&D. 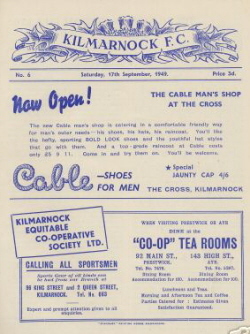 Programmes is based at 49 Titchfield Street, Kilmarnock and whether you are a programme collector or not, Douglas will be only too delighted if you drop in. 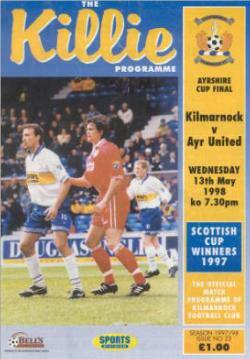 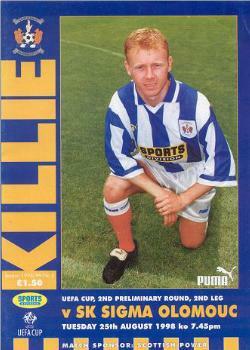 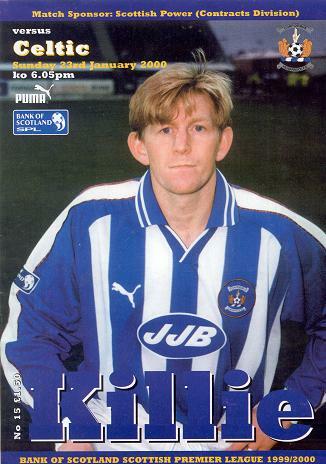 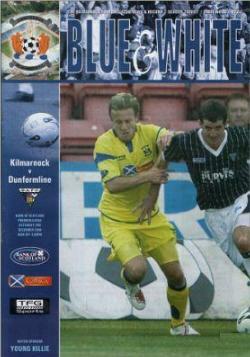 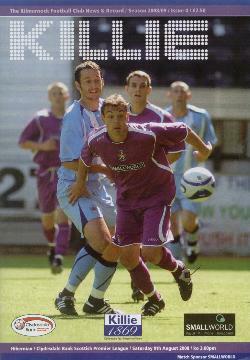 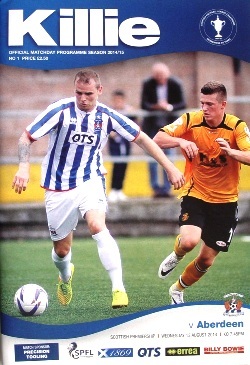 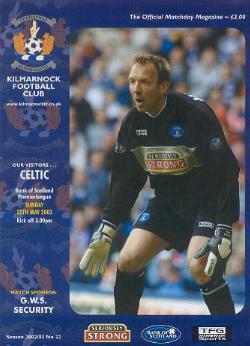 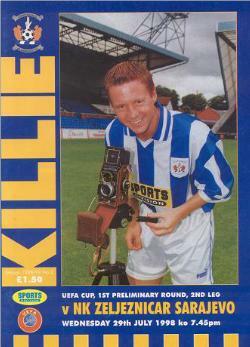 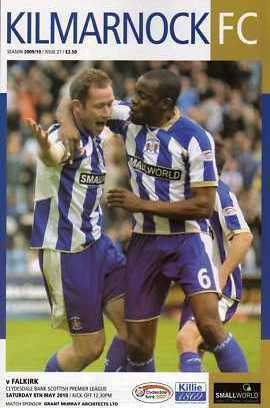 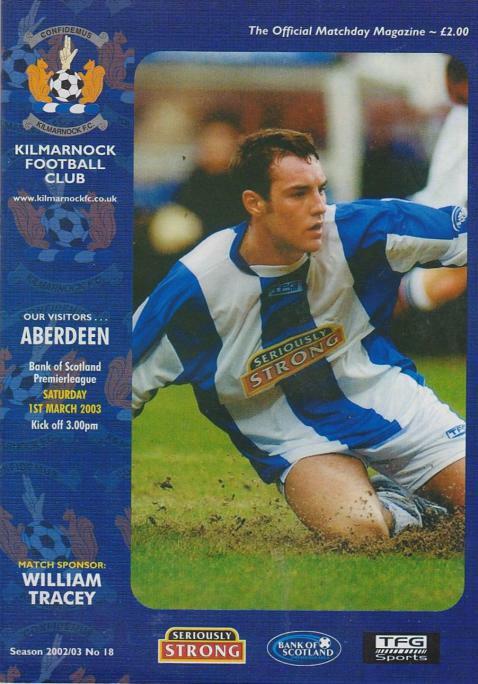 The 2nd issue of the 'Collectors Guide For Kilmarnock Programmes' is available from the shop or from Richard Cairns. 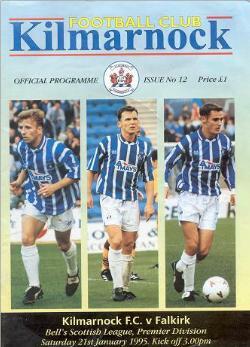 Priced at £3.50, it is a superb reference for existing collectors or anyone wishing to start collecting. 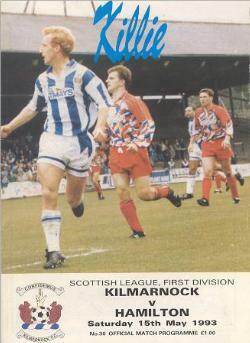 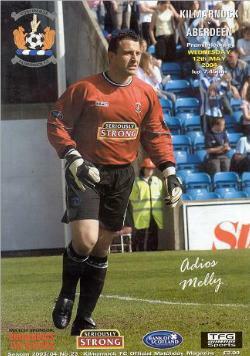 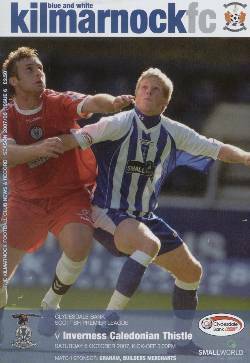 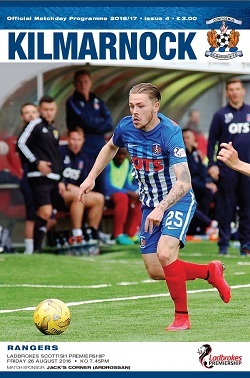 This rest of this page is dedicated to a complete review of the changing face of the Official Kilmarnock FC Match Programme. 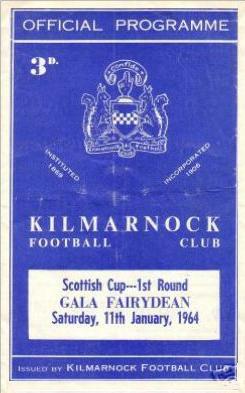 It was priced at a mere 3d in the 1950's to becoming £2.50 in the new millennium. 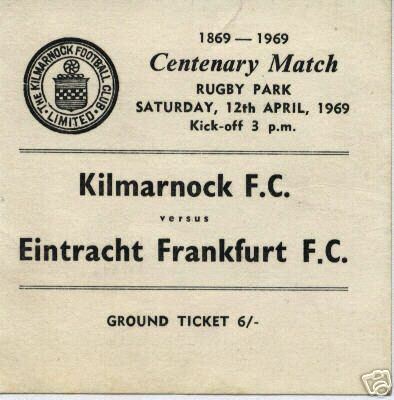 This means it is 200 times more expensive today than back then!